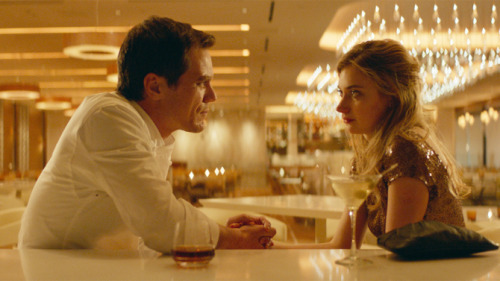 Frank (Michael Shannon) a chef meets Lola (Imogen Poots) and they fall head over heels for each other. However when an old flame of Lola's shows up and she cheats with him Frank is sent spiraling down the road of jealousy. Things get complicated when Frank realizes that Lola isn't telling him the whole story. Dark thriller of love, obsession and abuse is based on the life of a friend of the directors. Its a dark tale of the sort that many people get trapped in. Watching the film one had the sense that this was/is/could be real just without the amped up movie thriller overtones. Having been in several relationships where secrets were kept and half truths told I could relate to what Frank was going through. For me there was a visceral quality to it all as I was forced to relive bits of my past as Frank was going through his present. While the script is quite good the performances of the two leads are the real reason to see the film. Shannon and Poots give killer very real performances. There is a tangible feeling to their feeling for each other as well as to their hidden parts. Both actors give us infinitely more shading to their rolls and to the story than is in the script. We can see everything happening behind their eyes and it lifts the film up from being very good into the realm of being truly special.